In celebration of the Curiosity rover's third year on Mars, NASA has launched a 3D simulation of the rover that anyone can access through a web browser. The simulation, which you can find here, uses real mechanics and data collected from Curiosity and NASA's Mars Reconnaissance Orbiter (MRO), with NASA saying it will give "users first-hand experience in a day in the life of a Mars rover." "We've done a lot of heavy 3-D processing to make Experience Curiosity work in a browser," said Kevin Hussey, manager of the visualization applications and development group at NASA's Jet Propulsion Laboratory (JPL). "Anybody with access to the web can take a journey to Mars." The browser-based simulation will let you move the rover around Mars, as well as take a panoramic photo or a selfie and drill into the surface of the planet. You can also move Curiosity's different parts, learn about the different areas of the map and view the red planet from its different cameras. 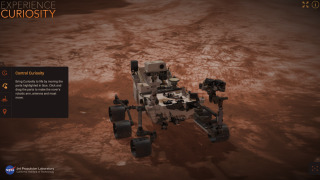 "At three years old, Curiosity already has had a rich and fascinating life," said Jim Erickson, the project manager for the mission at JPL. "This new program lets the public experience some of the rover's adventures first-hand."